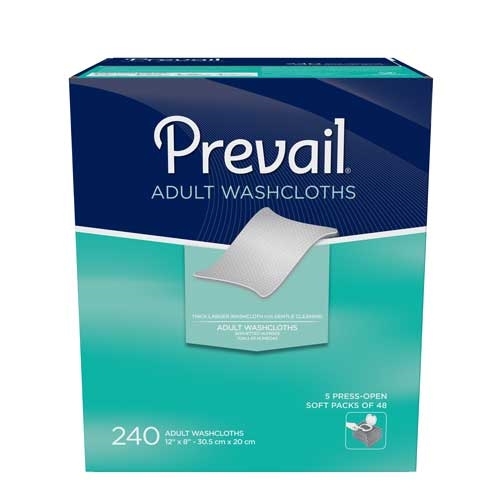 Prevail Adult Washcloths in 240 count case contain 5 packs of 48 disposable cloths in a soft pack with a press open lid. The thick large washcloths measure 12" x 8" and have a dot pattern for gentle cleansing. They are super strong and soft with Skin Smart that is hypoallergenic and enhanced with lotion to promote skin health and wellness. 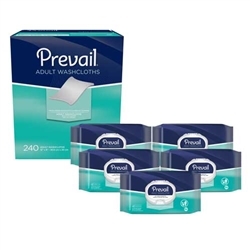 Perfect for general rinse free skin and incontinence cleansing. Skin Smart - a combination of Aloe, Chamomile, and Vitamin E that helps moisturize skin. TriForm Fabric - a unique three-layer fabric for gentle effective cleaning that resists tearing while keeping hands cleaner. Single-Hand Dispensing - by combining pop-up folding and a special kid design, a single washcloth will be dispensed each time without reaching in, adding convenience and reducing waste. Press Open Lid - with just one finger and a touch of a button the lid is easily opened. Lotion Enhanced - moisturizes skin to promote skin wellness. These wipes are only available in the reduced case quantity for users that may not wish to commit to such large case quantities.